The Naval Long Service Medals by Kenneth Douglas-Morris originally published in 1991 contained a partial list of all recipients of the Wide suspender Long Service and Good Conduct medal. This list was based on reviewing thousands of individual RN service records in the ADM29, ADM139, and ADM188 series held at the National Archives in Kew. There was no formal Admiralty medal list, and often only a clerk’s cryptic notation indicated that a medal may have been awarded. Based on incomplete Royal Mint records Douglas-Morris estimated 4147 Wide suspender medals were minted and sent to the Admiralty. 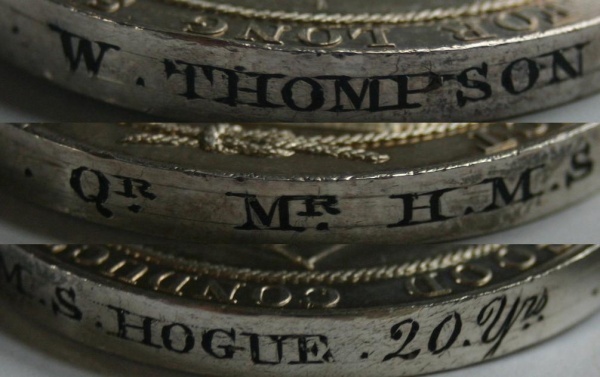 He created the first Royal Navy and a Royal Marine rolls containing 1430 and 787 names respectively. Often, only the actual sighting of a medal 100% confirms that it was awarded. These extant medals were duly noted in his rolls. My purchase of his books Naval Medals 1793-1856 and Naval Medals 1857-1880, and The Naval Long Service Medals certainly were part of the reason that I started to seriously collect medals to the Royal Navy and Royal Marines. All three books are a must for anyone interested in collecting Victorian RN/RM medals. Each time I sighted a medal at auction I would, as Douglas-Morris had done, put a little asterisk next to the man’s name. Other collectors most likely did the same, and collectively all those collecting eyes have spotted and recorded dozens if not hundreds of additional Wide suspender LS&GC medals since the publications of these books. Now is the time to initiate a web-based roll and extant list to continue what the late Douglas-Morris started. I have been fortunate enough to meet Dr. G.W. Hawkes, who also had similar collecting interests, and also kept his own extant list. I will give him great credit for doing the yeoman’s work of transcribing the rolls, which I then put in Excel format and made as many corrections and additions that I could do prior to getting this roll on-line. To expedite getting it on-line I decided only to do the RN. The RM roll and extant list will either be combined or added separately in the coming months. I hope one day to go through an attic full of old catalogues, to add provenance, other medal entitlements, and date and place of birth, but my first task was to be able to share this data and to get fellow collectors and descendants of these men to add to the roll which now contains 1554 names of which 517 are thought to be extant. Douglas-Morris predicted that most of the missing men were RN and that his RM roll was mostly complete, so if he was right we have close to 2000 names to be added. Please respond to this blog with any additional information of extant medals. HMS Excellent and HMS Cambridge were gunnery training ships in Portsmouth and Devonport respectively. Many a Gunner’s Mate or Chief Gunner’s Mate received his medal while serving on these ships. 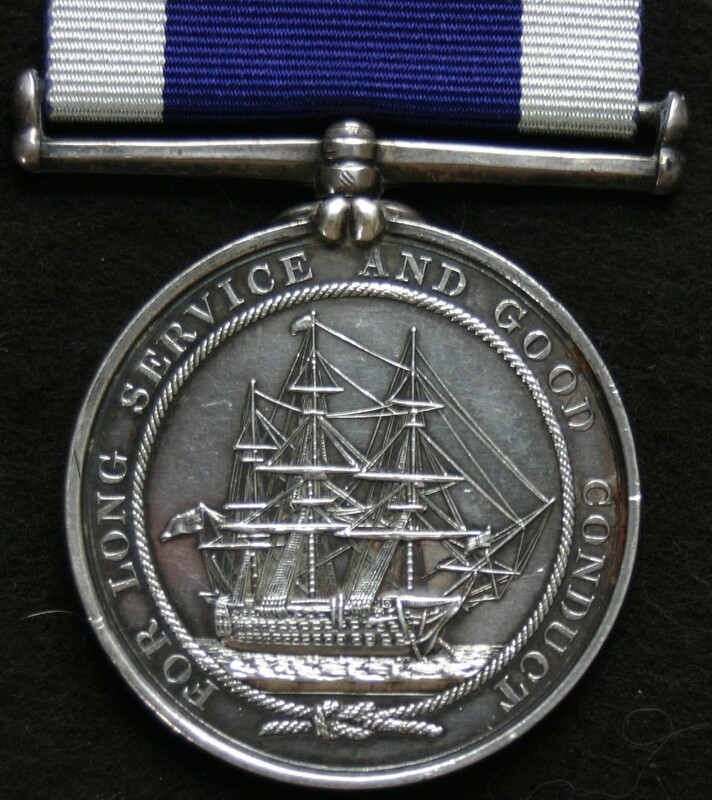 Generally this medal was for Petty Officers, but often it was give to Able Seaman Pensioners – men who had served their 21 years for pension but continued serving often in harbour vessels used as guardships. The Master at Arms, nicknamed “jaunty”, a corruption of the French “gendarme”, was a Chief Petty Officer rate assisted by Ship’s Corporals. Together they were the ship’s police force and often were pensioned Royal Marines deciding to continue their careers in the RN to get additional years for pension and the possibility of a long service medal. As the Royal Navy evolved so did many of the rates. Engine Room Artificer (ERA), maybe a unique rate on a Wide suspender medal, became more common as the navy went from sail to steam on the Narrow suspender LS&GC medals. Many rates like Sailmaker and Ropemaker became rarer as the end of the century neared. Although thousands of RN men eventually served with the Coast Guard, it was not until 1873 that the Admiralty decided that they could be entitled to the LS&GC medal. Douglas-Morris concluded that there were only 42 awards of the Wide suspender made to the Coast Guard 39 of these men have been potentially identified. When entitlement was allowed, it was generally awarded to very long servicing men often with 30 years or more of service. A quota of 22 medals per year was set for the Coast Guard. In 1847 when this medal was instituted the RN eligibility rule was to serve 21 years above the the age of 20. The RM rule was 21 years above the age of 18. This was later changed for the RN to 20 years when Continuous Service (CS) was introduced in 1853. Prior to CS the sailors only signed up for a ship’s individual service, maybe a 3 or 4 year commission. When the ship paid off the sailor was free to do what he wanted. He was no longer being paid, but he could do as he liked and was under no obligation to sign with another ship. If one reviews many of the ADM29 series service records one can find short gaps between service of subsequent ships. The advantage of this for the sailor was he could chose the ship and the captain and if wise were often selective. To always ensure a full complement of men, the RN decided to introduce CS. The sailor would be paid continuously, even between ship commissions, and were often assigned to harbour or depot ships temporarily while waiting for another ship’s commission. The disadvantage was the RN sent you where they wanted to send you, and with whatever captain they chose. Reducing the time to pension by one year was one of the enticements to get sailors to sign up for continuous service. So as a general rule, medals with only 20 years on the edge were post 1853. 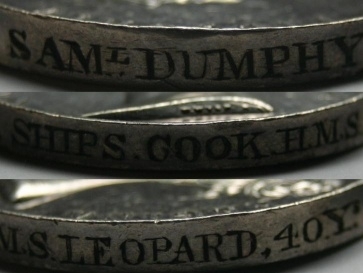 And one to Samuel Dumphy Ship’s Cook, H.M.S. Leopard, 40 Ys. One will find that the Ship’s Cook was a Chief Petty Officer and often held by an old salt or someone who had been invalided in the service, and probably possessing absolutely no culinary skills at all. So please contact me at wpickeri6@gmail.com or blog any additional Wide suspender LS&GC medals that are not yet listed on the roll or extant list. Personal information will be kept in strict confidence. Search the roll on-line here.